Nevada Dual Motor Rise and Recline Chair. The Nevada Rise and Recline Chair features a dual motor mechanism allowing independent operation of the leg rest and backrest providing countless recline options for finding the most comfortable position. The dual motors enable the leg rest to be elevated, or lowered, and the backrest to be reclined independently to give more flexible support options. All this can be achieved with a simple touch of a button on the easy to use handset. Ideal for people with restricted mobility, the Nevada Dual Motor Rise and Recline Chair will smoothly rise and tilt the user to a standing position. The ergonomically contoured seat and back are padded offering excellent comfort and the three tier waterfall back design provides additional support. Mains powered, the chair is incredibly quiet when in use and has a battery back up facility in case of an emergency or a loss of power (batteries not included). The built in pockets on the side are handy for attaching the four button, touch responsive hand control or can be used for storing the newspaper or TV remote control. The chair is upholstered in excellent antimicrobial PVC that helps reduce the risk of spread of infection and is easy to wipe clean for improved hygiene control. Furthermore, it has been Crib 5 tested for fire retardancy making it suitable for use in nursing, care and residential Homes. 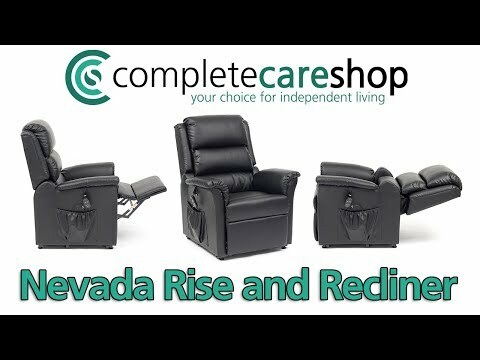 The Nevada Dual Motor Rise and Recline Chair is available in a range of colours that are all available to purchase from this section of the shop.